A photo book you'll adore. If you live in New York City, you might be familiar with the professional photography shop Adorama in lower Manhattan. The company has taken its photo printing to the web with AdoramaPix, where you can order prints and create various products, including photo books. Whatever Adorama learned running its photo emporium has worked. AdoramaPix wowed us with its polished and snappy editor, original-looking photo prints, and high-quality photo book. AdoramaPix offers photo books oriented as square (starting at $32.99), portrait (starting at $31.99), and landscape (starting at $36.99), with 14 different sizes total. You can further customize your book with nine different paper types and a hard, soft, fabric, or even leather cover. All of the hardcover, fabric, and leather books have pages that lay flat. For this review, we ordered a 10x12.5-inch landscape hardcover book with silk paper, and removed AdoramaPix’s logo branding, which came to $75.99 excluding shipping. 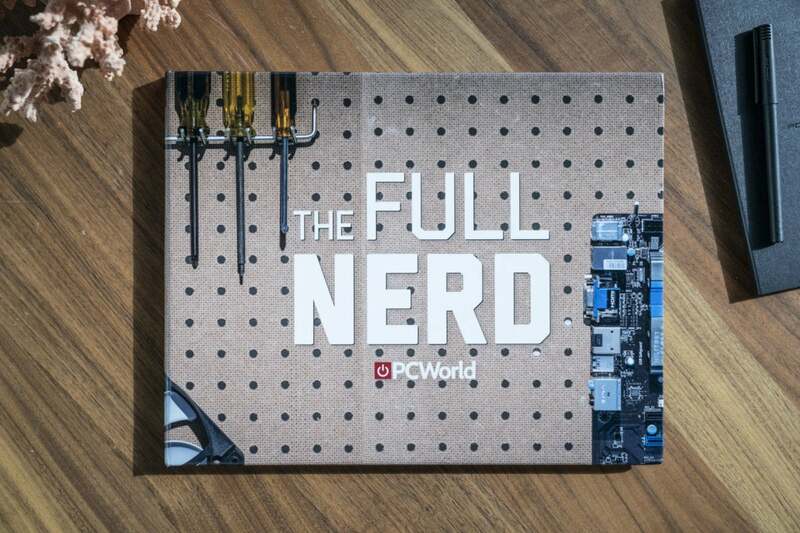 Our subject matter: A yearbook for PCWorld’s “The Full Nerd” video show. Editor’s note: This review is part of our best photo book roundup. Go there for details about competing products and how we tested them. Editing the book felt very smooth and went even quicker than our other favorite editor from Mixbook. I particularly liked adjusting my workstation by moving around different editing panes (such as the text editor) in the app. Overall, the AdoramaPix editor was among the best of all the photo book services PCWorld reviewed. AdoramaPix’s wide, clearly labeled photo uploading dashboard that lets you “import from almost anywhere” was the first thing to impress me. 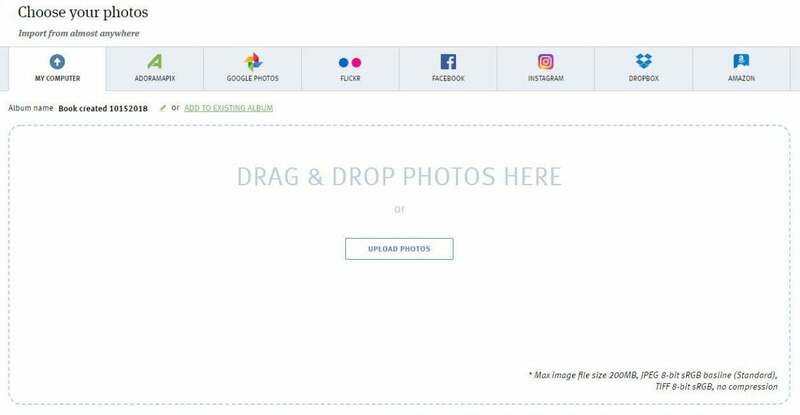 You can upload photos from your computer, files you already have on AdoramaPix, cloud services like Google Photos, Dropbox, and Flickr, and social media like Facebook and Instagram. The uploader was fast and makes this initial step a breeze. Here’s AdoramaPix’s super-compatible photo uploader. If you aren’t keen on sizing and placing your photos one by one, there are 73 designs you can choose from under the Designs tab. Each design lays out the pages so you can easily drag and drop photos or add text. 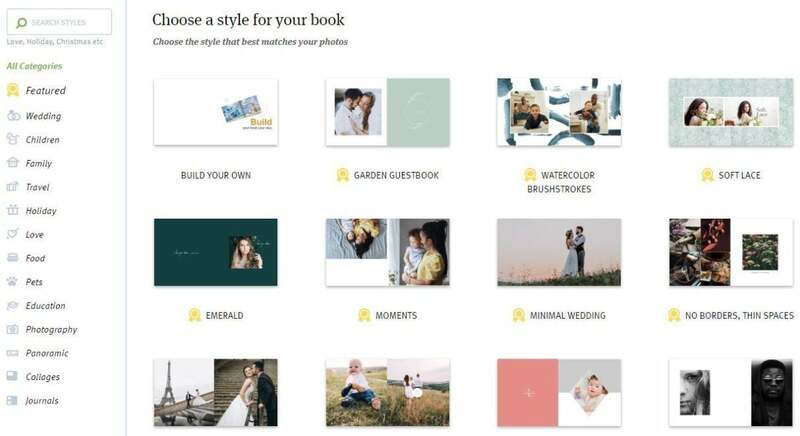 The designs include typical categories like “wedding” and “holiday,” but also includes material for wildlife photography and pets. Some of the many themes AdoramaPix offers. You can also forego these themes entirely, and apply page layouts from the Layout tab, which is what we did when we made our book. Then you can drag and drop photos into frames, and resize them by dragging the corners of the photos. When it comes to styling your pages, the Background tab has nearly 2,000 different choices you can apply to the pages. You can also just set the background to a solid color from the color picker. Then you can add even more flair to your individual photos via the Frames and Stickers tabs. With more than 2,500 options to choose from, frames can round the edges of photos or give them cutout effects. And then there are more than 14,000 different stickers to paste onto the pages, including calendars and more. Here’s what AdoramaPix’s editor looks like. Placing and styling text is also very easy to do. When you’re editing text, you can hit Apply to all under Copy/Paste Style to style all your text at once. We wish other editors had this feature because it makes creating a consistent type treatment so much less painful. AdoramaPix has a great editor, but it can be tricky to find a saved photo book project because these oddly don’t appear under the My Projects page. In fact, there doesn’t seem to be a “photo books” section under My Projects at all. Instead, go to Your Dashboard under the Account tab in the top right to view your projects and open them up. Another annoyance: You can’t edit a book after you’ve added it to your shopping cart. When a book is finished, you can only hit View book, and if you open the editor at this point, it doesn’t let you go back to the Customize step. To work around this, select Copy to create a version you can Edit & Complete. AdoramaPix is also one of the few photo book services to offer a gift box—it comes in either “creamy beige” or “chestnut” for an extra $12.95. Our sample came in a gift box, which was thick cardboard and tied with a stretchy sash that slid off to reveal the book wrapped up in parchment-like gift paper. The prints from AdoramPix were top-notch, as evidenced by this three photo spread. Notice the lay-flat pages. In short, the book was stunning. The spine had a perfect rounded curve and the colors of the front and back covers popped with a beautiful glossy finish. Photos inside came out gorgeous and really shined on the silk pages of the book, which laid flat perfectly and felt durable. If you’re a fan of shiny pages, we highly recommend the silk option. 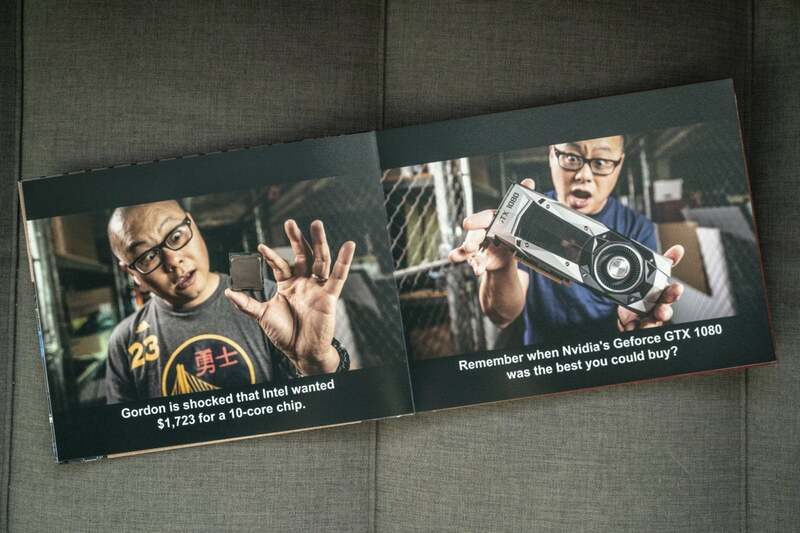 There are really no complaints when it comes to the photo book. As a total package, it was superior to all the others we reviewed, and the photos were on par, if not better, than those from competitors like Mixbook and Shutterfly. AdoramaPix made PCWorld executive editor Gordon Mah Ung look even more excited about this tech. First off, AdoramaPix includes the lay flat style in all of its photo books at no additional cost. Mixbook, on the other hand, charges an additional $40 for its “premium lay flat” option. Other services also charge more for lay-flat pages. None of the six page paper options added any additional cost, either. So our 10x12.5-inch landscape book with silk paper came to $75.99 and included economy shipping. At $75.99 with economy shipping, AdoramaPix was more affordable than similar options from Mixbook ($81.28) and Picaboo ($91.78). That means AdoramaPix doesn’t just make a great photo book—it also offers a great deal. AdoramaPix leaves little to be desired. It offers an excellent editor, photo reproduction that looks like originals, and a high-quality printed book. 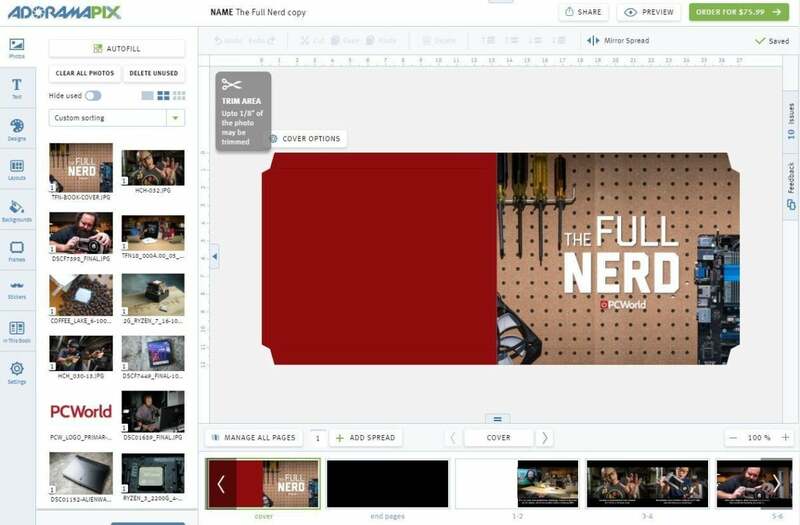 Easy-to-use, fast online photo editor. 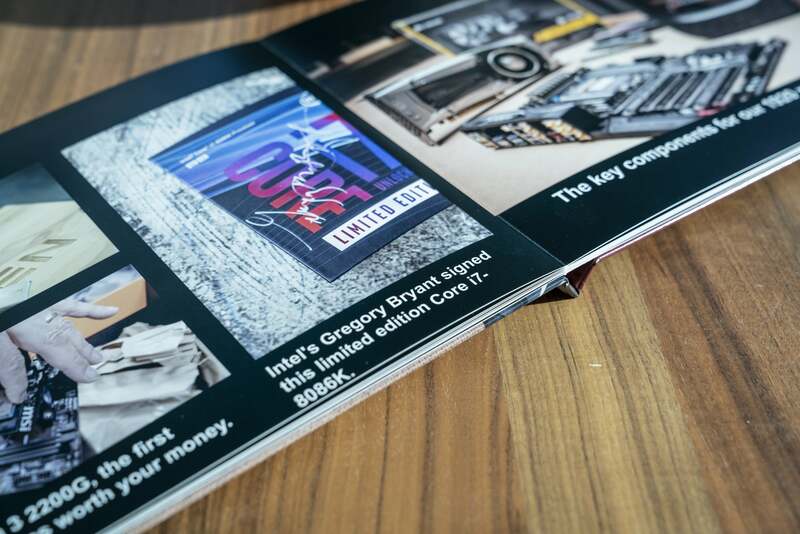 Great-looking photos with an “original” print quality. You can apply font styles to all pages at once. Can’t edit a book you’ve already finished making. Not many larger sizes to choose from. Charges $2 to remove the logo on the back page or to use your own logo.